The notification for NDA 2019 was released in the month of January and NDA 1 examination is scheduled to be held on 21st April 2019. When it comes to preparing for defence examinations or say any other competitive examination, having an idea of what's been asked in the past few years is a must. And, for that, test series package incorporating all the recent previous years' papers serves a great purpose as one gets to practice with time-bound mock tests with questions asked in previously held examinations. Regular practice not only helps you develop marvellous skills to ace an examination but also empowers you to get better as time goes by. Once you attune yourself to constant practice with mock tests, the real examination no longer seems outlandish to you. So, practice hard, compromise it for nothing and ace NDA 2019 Exam this time. 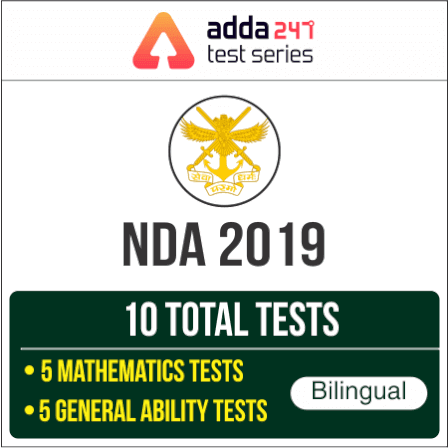 Here is Adda247 National Defence Academy (NDA) 2019 Online Test Series Package with 12 Previous Years' Mathematics Papers at a nominal price of Rs 249. With this package, discover where you stand and how much more you need to strive, because, in this fight for Defence exams, it's like, shape up or ship out, and you are the one who has to decide if to withstand the competition or quit. If you are willing to bring the house down then subscribe to Adda247 NDA Mathematics Previous Year's Papers 2013-2018: Online Test Series Package while the going is good.